The hypothalamus controls autonomic nervous function as well as many endocrine system functions. It resides adjacent to the third ventricle of the brain and immediately inferior to it is the pituitary gland. The posterior lobe of the pituitary develops from the brain and is a structure that is continuous with the hypothalamus. It has within it specialised neuronal axons that release hormones from the hypothalamus into the lobe, storing them for when they are needed and releasing them into the capillary bed of the pituitary gland. 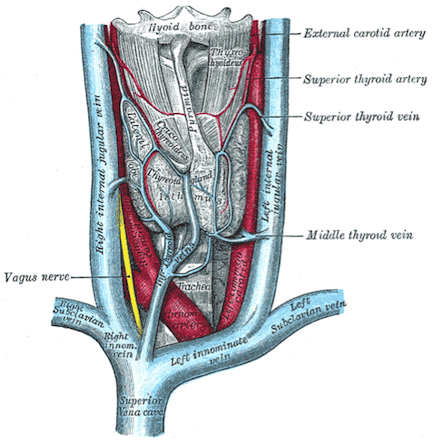 ​In contrast the anterior lobe of the pituitary is structurally a secretory endocrine gland receiving the hypothalamic hormones via hypopophyseal portal vessels. In this way, a neuro-hormonal axis is in control of some hormone levels and endocrine responses. The hypothalamus, pituitary gland and endocrine system maintain control of hormone release through negative feedback loops. Most hypothalamic hormones include the words ‘releasing hormone’ or ‘inhibiting hormone’ in their name. They act to cause the pituitary to release or inhibit release of another hormone often termed a ‘stimulating hormone’. This hormone acts on receptors in an endocrine gland to cause that gland to release its hormone. ​For example: the hypothalamus releases thyroid releasing hormone (TRH) which causes the pituitary to release thyroid stimulating hormone (TSH) which acts on the thyroid to release thyroid hormone (TH). Blood levels of TH then regulate the hypothalamus and pituitary hormone release. ACTH stimulates the adrenal gland to release glucocorticoids – namely cortisol. Cortisol has a number of metabolic effects to enable the body to cope with stress, including altering the way the body manages blood glucose levels. FSH and LH are released in response to the gonadotrophin releasing hormone. These hormones act on the male and female gonads. The posterior pituitary is responsible for releasing: oxytocin and anti-diuretic hormone (ADH), which also has the name vasopressin. Oxytocin is released in response to mechanoreceptor signalling to the hypothalamus in order to cause the milk let-down reflex when a baby suckles and uterine contractions during birth. During birth a positive feedback loop ensures oxytocin effects on the uterus continue until after the placenta is delivered. ADH is released when osmoreceptors detect changes in blood osmolarity or arterial baroreceptors detect a drop in blood pressure. The hormone acts on the kidneys to increase fluid retention in order to increase blood volume and hence blood pressure. The thyroid gland resides in the neck, anteriorly, and is usually a butterfly shape with superior parts of each wing (lobe) lying adjacent the lower edge of the thyroid cartilage, and the inferior parts of the lobes lying above the suprasternal notch (where the clavicles join the sternum). It is a very vascular structure. It has two main cells types: the C cells that produce calcitonin and the follicles that synthesise, store and release TH. Thyroid hormone is produced by adding iodine (iodinating) to the amino acid tyrosine to form thyroxine (known as T4 which is short hand for tetra-iodothyronine) and tri-iodothyronine (known as T3). T3 is more biologically active than T4. ​TSH stimulates both TH manufacture and hormone release. Circulating T3 and T4 have a negative feedback effect on TRH and TSH. Both are lipid soluble and diffuse across cell membranes to act within the cell. T4 is mostly converted to T3 which then binds to target receptors on the nucleus resulting in increased DNA transcription promoting protein synthesis. Enzyme activity consequently increases causing the metabolic rate to increase along with the promotion of growth. In this way TH acts synergistically with growth hormone. Normal TH levels are critical for normal brain development and stimulate bone growth in childhood. As iodine is necessary for production of TH, iodine levels need to be normal within the body as well. The increased BMR results in increased respiratory ventilation to supply oxygen for metabolism and energy production as well as increasing the gut motility and secretions. TH also raises the heart rate and reduces peripheral resistance so that cardiac output increases to meet tissue metabolic demand. Central nervous system (CNS) activity and alertness also increase. 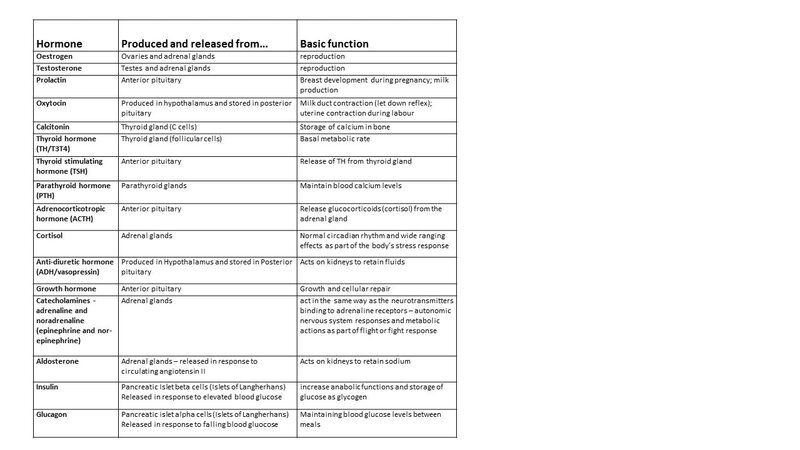 Using this list of actions can you predict the physiological signs and symptoms of someone who is hyperthyroid (too much TH) or someone who is hypothyroid (has too little TH)? (See TedEd video). Someone who is allocated the term ‘euthyroid’ has normal TSH and TH blood levels but may not have a structurally normal gland such as having a non-functioning nodule within the gland. Growth hormone releasing hormone (GHRH) and growth hormone inhibiting hormone (GHIH or also named somatostatin) control levels of growth hormone (GH) in the body. Growth hormone is also named somatotrophin and is a major anabolic hormone acting to increase cell division and tissue growth. The hormone is released spasmodically with the kidneys and liver responsible for removing it from the body. Its most obvious effects are seen in childhood and adolescence but once the growth plates of the skeleton are fused, GH continues a role in homeostasis. In situations of trauma and stress GH is important for tissue repair. GH acts by causing the liver to produce somatomedins, such as insulin-like growth factors I and II (IGF-I, IGF-II). These chemical messengers promote protein synthesis in most of the body’s tissues and the breakdown of fat to produce ATP. Utilising fat for energy production has the effect of sparing carbohydrates for glycogen storage as well as raising blood glucose levels. Low blood glucose causes the GHRH to increase and inhibition of GHIH from the hypothalamus and the pancreatic islet delta cells. In this way, GH helps maintain blood glucose levels within the normal range for structures reliant on glucose for energy (such as the brain) whilst utilising fat for energy for the cellular processes the hormone promotes. Low GH levels are associated with impaired growth in children and adolescents. In adults low levels will contribute to bone and muscle mass loss, decreased muscle strength, altered lipid profiles and increased abdominal fat. The pancreas contains both cells for producing digestive enzymes that are released to the duodenum during food breakdown (see [Digestive system module]) AND cells that release the hormones insulin and glucagon to the blood flow to manage blood glucose levels. The pancreas is both an exocrine and endocrine organ. Insulin secreted by beta cells and glucagon secreted by alpha cells of the pancreatic islets act to maintain blood glucose within normal limits over time from when we ingest food and break it down and between meals in the post absorptive state. ​This hormone, once released, remains in the blood for approximately 10 minutes until broken down by the liver and kidneys. It is released when blood levels of glucose rise above normal following a meal to promote cell glucose usage and storage. Insulin binds to surface receptors on cells and is often described metaphorically as a ‘key’ that unlocks the ‘door’ allowing glucose to enter the cell. As blood glucose levels fall so too does the level of insulin in blood. Insulin will also be released if amino acid concentrations increase in blood. The hormone triggers cellular uptake of these amino acids for protein synthesis particularly in muscle cells. Insulin also promotes the storage of triglycerides in adipose tissues and the use of carbohydrates, rather than fats, for energy production. Resting muscle cells usually use fatty acids for energy production but immediately after eating, when insulin levels are high, muscle cells swap to using carbohydrate. ​Diabetes mellitus (DM) arises either because there is loss of pancreatic beta cells to produce insulin (DM Type 1) and so blood glucose remains high constantly, or because tissue cells become resistant to the effects of insulin (DM Type 2) so that the cells do not allow entry of glucose to their cytosol. Consistently high blood glucose damages vessels resulting in vascular and vascular related diseases including impaired tissue repair, as well as resulting in peripheral neuropathy. Consequently, the effects of DM can be devastating if blood glucose levels are not maintained within the normal ranges. Pancreatic islet alpha cells release glucagon when plasma glucose levels fall below normal between meals. These cells release glucagon when there are high levels of amino acids as well counterbalancing the action of insulin in circumstances of high protein meals that might result in hypoglycaemia if the action of insulin went unchecked. The actions of glucagon include glucose sparing for energy production causing fatty acids to be used instead. ​In order to cause the release of fatty acids for energy use glucagon activates hormone-sensitive lipase. ​TH maintains basal metabolic rate adjusting it throughout the day in response to the internal and external environment. It has a major role in anabolism (protein synthesis). GH is another hormone with a major role in anabolism and it works in synergy with TH. Further, GH impacts on blood glucose levels by acting to spare carbohydrate usage for ATP production. GH release will increase when blood glucose levels are low. Insulin also has a role in anabolism as well as glucose use and storage. GHIH hormone (somatostatin) will inhibit not only growth hormone release but also inhibit insulin release. The pancreas also can release somatostatin from delta cells of the pancreatic islets. ​In this way the hormones can act together to increase protein synthesis and raise blood glucose levels in concert with the release of glucagon from the pancreas. Klerman, E., Adler, G., Jin, M, Maliszewski, A., Brown, E. (2003). A statistical model of diurnal variation in human growth hormone. American Journal of Physiology. 285(5),E1118-1126. McGeown, J.G. (2002). Physiology A clinical core text of human physiology with self-assessment (Master Medicine series)(2nd Edn.). London: Churchill Livingstone. Mackenna, B.R. & Callander, R. (1997). McNaught & Callander Illustrated Physiology (6th Edn). London: Churchill Livingstone.